Yesterday I participated in my first ever book fair with Good Chinese Wife! I also met my new editor for Good Chinese Wife before the fair. It was really great to get to know Anna and learn all about her forthcoming YA novel, 26 Kisses (Simon Pulse, 2016). I can’t wait to read it! After meeting Anna, I headed to the author fair, which was held at the stunning, new Aurora Public Library about an hour outside Chicago. I was one of dozens of participating authors. Check out my table display. 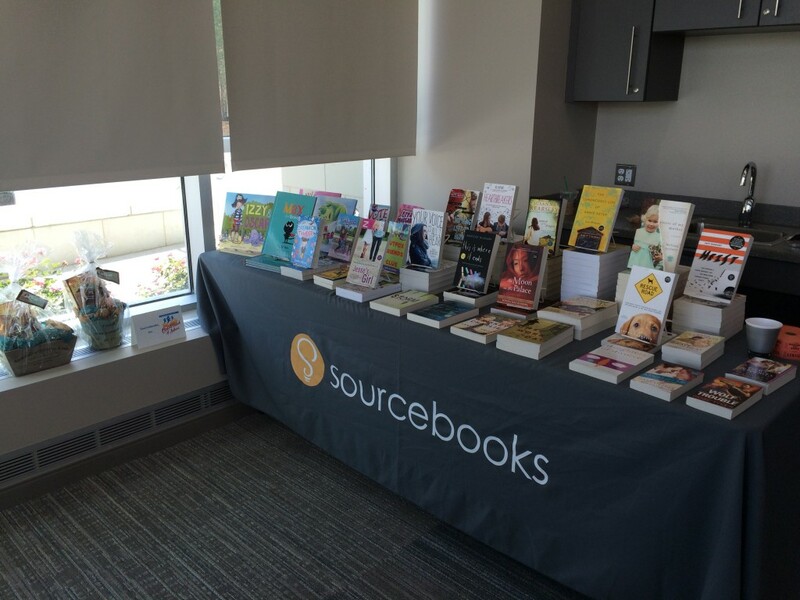 My publisher, Sourcebooks, had a fabulous table of give-aways. Yes, all of these books were out for people to take (I got three myself!). 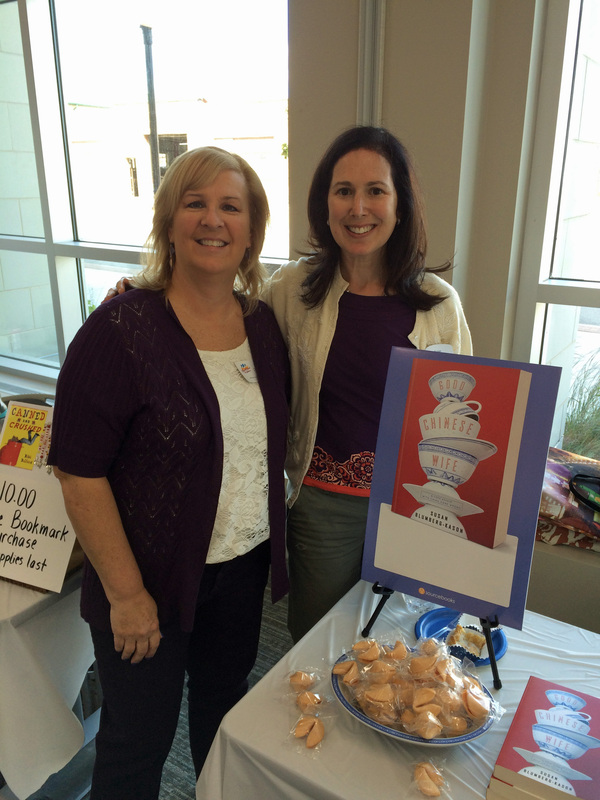 Beth and Alex, both in marketing at Sourcebooks, came by my table to say hi. 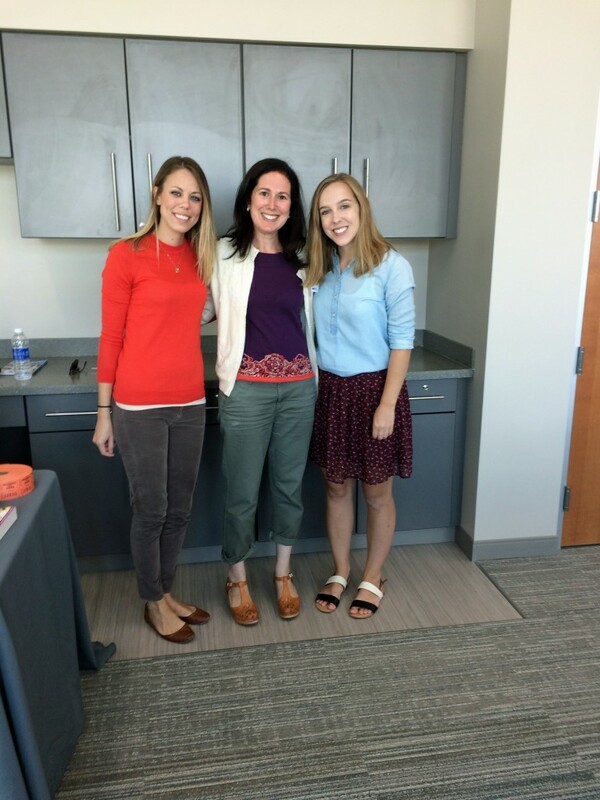 I’d met Alex at another Sourcebooks’ author event last year, but hadn’t met Beth before. I love their enthusiasm and friendliness. 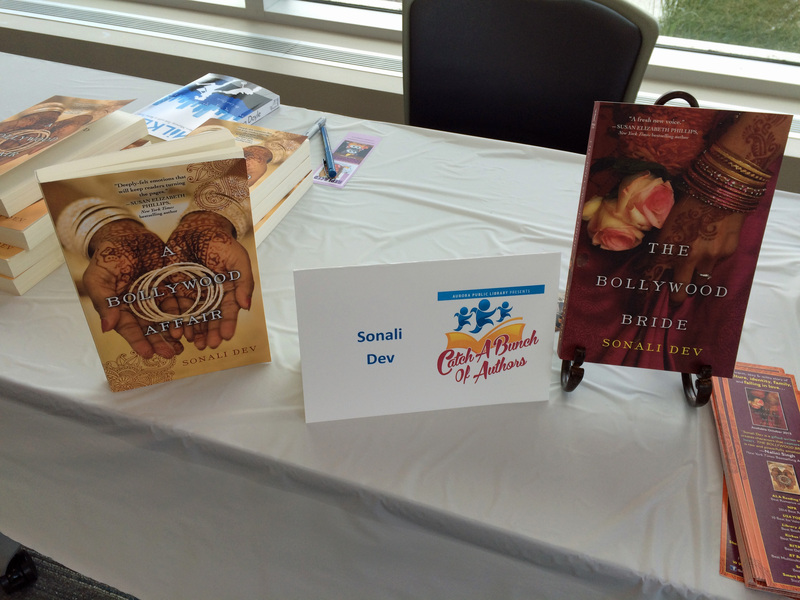 I found my way to this fair thanks to the generosity of author Sonali Dev, whose new book, The Bollywood Bride (Kensington, 2015), comes out later this month. 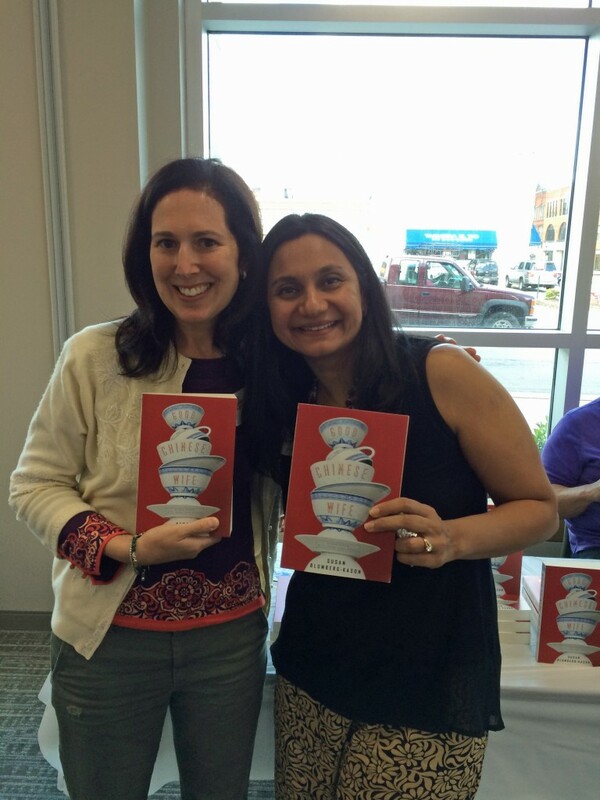 Here I am with Sonali! The other author I knew at the fair was agent-sister Brianna DuMont, whose must-read middle grades non-fiction book Famous Phonies (Sky Pony Press, 2014) came out last fall and whose next book, Fantastic Fugitives (Sky Pony Press, 2016) comes out this January. 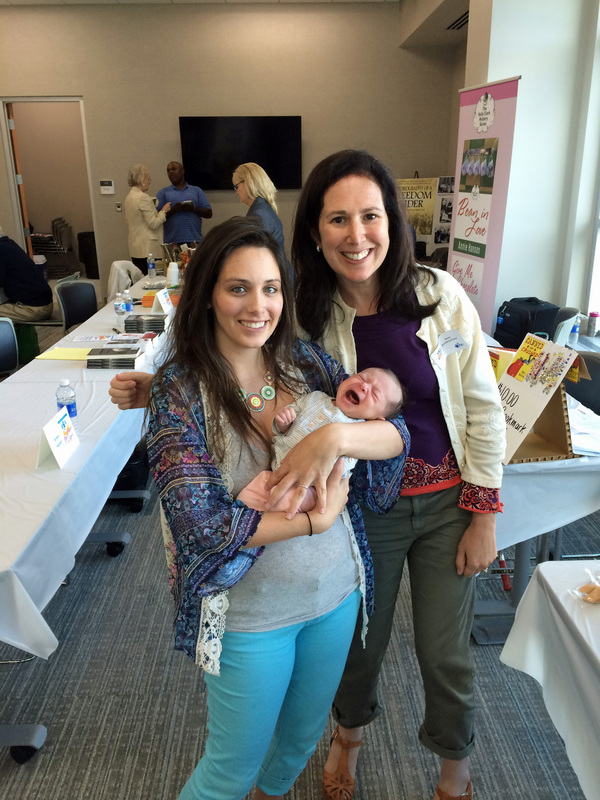 I was so excited to meet Brianna’s new baby! Sitting next to me was Karen Boncela, who I met for the first time yesterday. Karen is also a memoirist who has written about her abusive first marriage in Dark Secrets No More (Purple Knight Press, 2014) and her new marriage to her lovely husband, Eddie, in Words to Love By (Purple Knight Press, 2012). I really enjoyed talking to them and learning about her writing process and Eddie’s past life as a New York City policeman. We reminisced about Times Square in the mid-90s (which is featured my memoir!). On the other side of my table was Bibi Belford, the author of MG novel, Crushed and Canned (Sky Pony Press, 2015). We had a nice chat about writing and Chicago before the event started. It was great seeing and meeting all these publishing professionals. I also loved talking to readers and learning their stories. 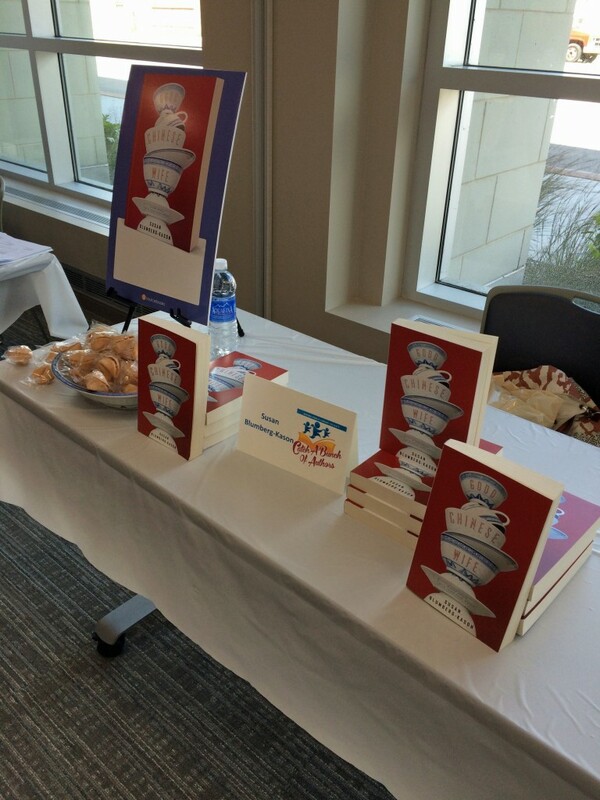 A huge thank you to Becky Clark at the Aurora Public Library for putting it all together! I enjoyed meeting you in Aurora. I was pleasantly surprised to see my picture here with you. My pics will be on my blog soon! You can see them now on my facebook page.Please give that page a LIKE and leave me the LINK for your facebook page so that I can do the same for you! Thank you so much! It was great meeting you, too! I’ll check out your blog right now! I don’t have a FB page for my book, just my personal page. It’s Susan Blumberg-Kason. I’ll like yours now! I have added so many of these books to my Goodreads list, they all sound amazing! Do you ever do any of these fairs in Canada? I’ve never been to one before, would love to attend!